WAIST HIGH: Chemical Depot Really Close To An Active Volcano News. Chemical Depot Really Close To An Active Volcano News. (katu.com) HERMISTON, Ore. -- The Umatilla Chemical Depot began destroying liquid nerve agent over the weekend. Nearly 560 gallons of the nerve gas known as GB agent were incinerated over 11 hours yesterday. 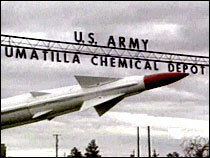 The depot began destroying rockets carrying the nerve gas last month. But the liquid nerve agent was stored until plant operators had a minimum of 500 gallons. The general manager of the disposal facility is Doug Hamrick. He says the beginning of agent feed to the liquid incinerator is a "major milestone." The depot has about 12 percent of the nerve and mustard gas weapons in the United States' stockpile and is under treaty obligation to destroy them. The process is expected to take about six years.